The phrase “Open Range” was made famous in a 2003 film of that name starring Kevin Costner. The movie was set in the 50-year period between the close of the Civil War in 1865 and the mass settling of the West by homesteaders in the early 1900s. The land was owned by no one—as its previous inhabitants, the Native Americans, were being forced onto reservations. This was the “trail drive” era, when wild cattle from Texas were being gathered out of the brush, collected into herds, and driven north on the old Chisolm Trail to feed gold miners in Montana. Grass was plentiful on the Northern Plains as the millions of bison had largely been exterminated. 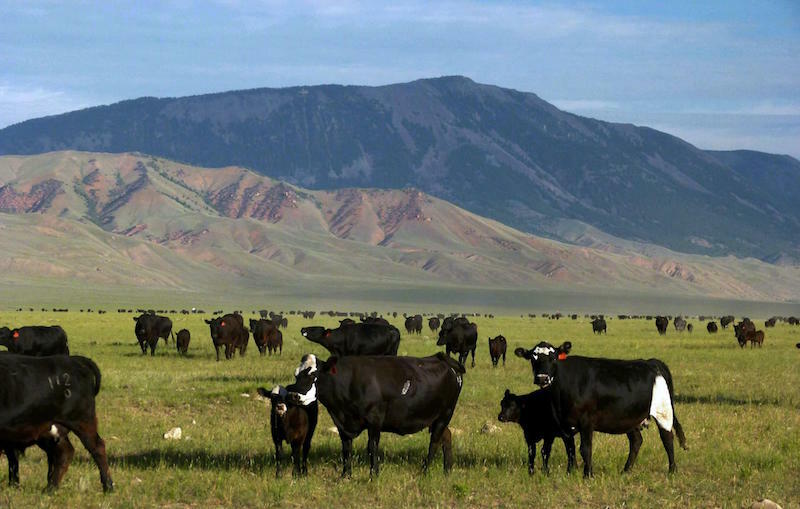 Cattle fattened quickly on the vast and empty grasslands, and were shipped east to feed a growing nation. The grass was free—and there was money to be made! One had only to raise enough cash to buy some cows and to pay some cowboys. Roundups were held in the spring to gather the cattle and brand all the calves born in the last year. Another series of Roundups were held in the fall to cut out the fat cattle, which were then trailed to railheads like Miles City. It was a romantic life! Cowboys lived wild and free on the prairies, owning only their saddles, their clothes, and their bedrolls. They had no expenses, as their home was their bedroll, and their meals—mostly beef, beans, and biscuits—were provided at the chuck wagon. They could draw their entire pay at any time—without Federal Withholding, Social Security, or Medicare—and spend it all in the next town on baths, haircuts, and new clothes (or whiskey, women, and cards). When the trail drive or roundup was finished, they were usually provided with a train ticket home. There were, however, a few drawbacks. The job was from daylight until dark and a 2-hour night watch. With no fences to hold the cattle, a portion of the crew had to be on duty 24 hours a day until the herd was delivered. And 7 days a week—even if it was raining or snowing! In the summer it could be hot, dry, dusty, and boring if you were the guy riding drag on a trail drive, or were assigned to hold the herd at a roundup. In the spring you might be wet, and in the fall you were likely cold—with no place to get out of the weather. The last bastion of the “open range” days of the late 1800s is the remaining “Open Range” laws. The states of the “intermountain west”—notably Idaho, Montana, and Wyoming—still carry on their books the Open Range laws written over a century ago. Outside of designated “herd law districts,” these Open Range laws state that I as a cattleman am not required to fence my cattle in; rather, you as a landowner are require to “fence out” unwanted cattle. These laws become especially important when you are driving through open range country. In the more sparsely populated areas—where cattle far outnumber people—cattle have the right-of-way. I am not required to fence my cattle away from the county road that passes through my property. In fact, US Highway 95 in Idaho is unfenced for hundreds of miles as it passes through private lands. And ranchers have no more obligation to fence out their cattle than the state’s Fish and Game Commission has to fence out their wildlife. So be careful while driving in Montana. You might encounter on the road at night a deer, an elk, a moose, or even a Black Angus bull—as the range is open to any of them.